This past Saturday was a 'Seafood Stock Up Day' at Giant Eagle Market District in Robinson. We buy most of our seafoods and meats at Costco, but Costco doesn't carry everything and sometimes it's cheaper to get it at GEMD. So Saturday morning SP went to GEMD. I expected him to stock up on the usual: canned crabmeat, shrimp, tilapia, maybe salmon. He returned home with some of those items plus a large package and, with a huge smile & twinkle in his eye, said,"Look what I got! Cod! Yum! Wouldn't it be great to have some fish this week? We haven't had fish in a while." Ummm... sure. He was right. It had been a while since we made fish. As usual, I was less than enthusiastic. Every time I think of having fish for dinner, I flash back to my youth when fish meant frozen fish sticks. Every Friday. With jarred tartar sauce. And Tater Tots. Or I recall the time that mom & dad cooked catfish in a skillet and the house stank of fried catfish for days. Bleah. More than the taste of fish, the smell gets to me. SP prevailed and Monday evening he made fish and quinoa. His cod is on the left; my tilapia on the right. Yes, I played it safe and stuck with tilapia. I wasn't ready to branch out and try cod. Both were prepared the same way: seasoned with pepper, covered with tomato slices, sprinkled with oregano, and baked in the oven. 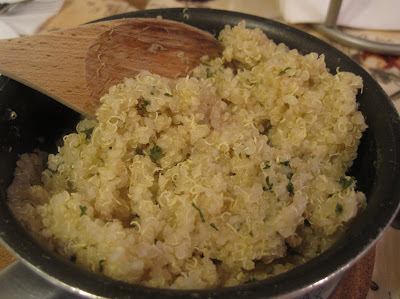 To go with the fish, quinoa with lemon juice, lemon zest, and parsley: Quinoa is growing on me. It's just as easy to make as rice, maybe easier. I prefer it flavored with lemon & herbs to just plain (which is how it was the first time I tried it and decided it wasn't very tasty). The fish was pretty tasty, too. The tomato and herbs helped disguise the fish! And the tomato juice kept the fish moist. In spite of the tilapia being pretty tasty, I'm not going to start suggesting fish anytime soon, even though I know it's good for me! 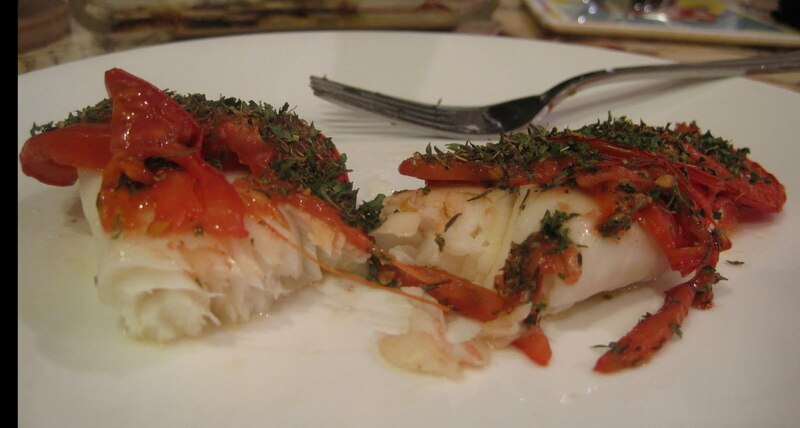 But maybe once a month we can have real fish (not shrimp & crab). And maybe I'll get crazy and try the cod - it did look nice and white and didn't have any gross silver stuff or scaly stuff or peering eyeballs.